Dropkick Murphys launched their nationwide From Boston To Berkeley Tour with co-headliners Rancid last week in Bangor, Maine, and shows are selling out across the country. The month-long trek marks the first time the bands have toured together after a long and important history together. 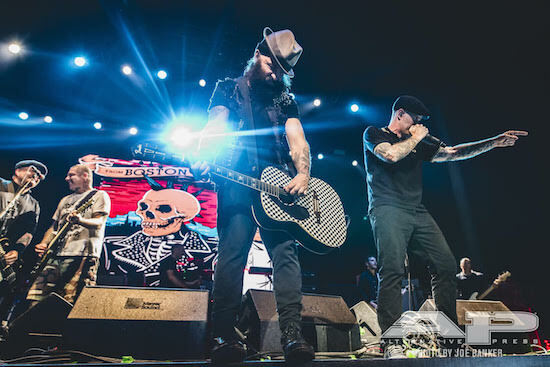 Each night culminates with a unique joint encore featuring Dropkick Murphys and Rancid sharing the stage for a mix of vintage punk and classic rock covers. The From Boston To Berkeley Tour also provides a special opportunity for those in attendance. 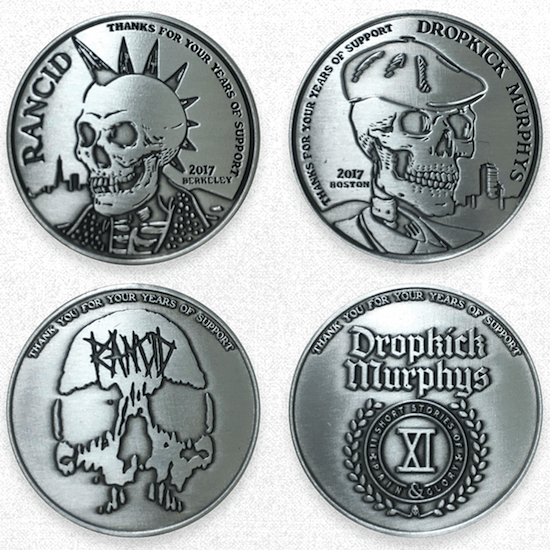 Two From Boston To Berkeley Tour Charity Challenge Coins — one featuring Dropkick Murphys and one featuring Rancid — will be available exclusively at the merch booth throughout the tour. The proceeds from each $20 coin donation will be split between The Claddagh Fund (www.CladdaghFund.org) and Musack (www.Musack.org). 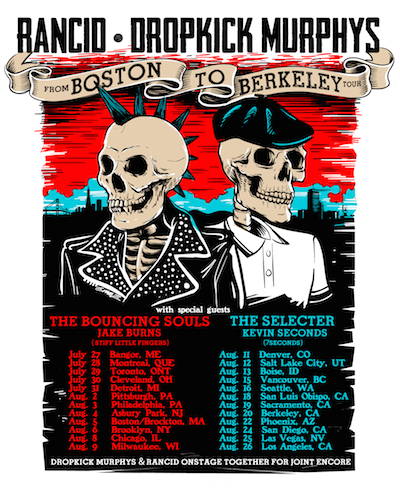 Dropkick Murphys and Rancid are joined by openers The Bouncing Souls and Jake Burns (Stiff Little Fingers) for From Boston To Berkeley Tour dates through August 9, and The Selecter and Kevin Seconds (7 Seconds) will open shows from August 11 through the tour's conclusion at the It's Not Dead festival in Southern California on August 26. Dropkick Murphys are touring in support of their 11 Short Stories Of Pain & Glory album, released through the band's own Born & Bred Records earlier this year. The album debuted at #8 on the Billboard Top 200 and was the #1 independently released album. There's a feeling of purpose throughout the album, influenced by the band's work with The Claddagh Fund, a charity the band established in 2009 to help support addiction recovery as well as children's and veterans' organizations. Dropkick Murphys are hands-on in raising funds, mentoring, and lending a helping hand with veterans, youth sports, and drug and alcohol rehabilitation. Many of the songs reflect these experiences, and the band's sadness, anger and dismay at the opiate epidemic ravaging the country — in particular, Boston and New England — and also their feeling of pride and optimism at the sight of those who have turned their lives around. Dropkick Murphys—Al Barr, Tim Brennan, Ken Casey, Jeff DaRosa, Matt Kelly, James Lynch—have become ambassadors for their city. In Boston, it seems like everybody knows someone connected to the band whether by blood, friendship, or the time they shared a brew at a Bruins game. They've built a legacy that does Beantown proud. 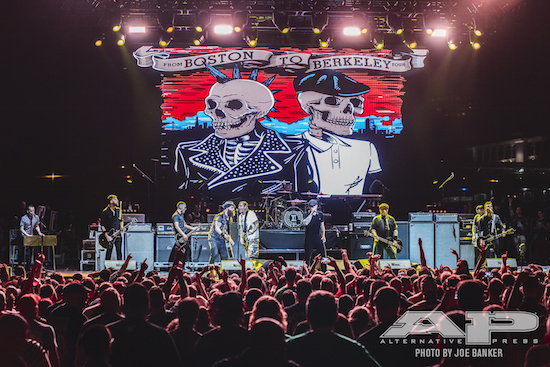 Here are some photos of the July 30 Dropkick Murphys and Rancid encore in Cleveland, Ohio taken by photographer Joe Banker (www.joebankerphotography.com).